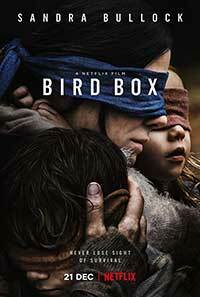 Bird Box is the new supernatural thriller from Netflix, which is executive produced and stars Sandra Bullock. Parts of the world are coming under a mysterious attack of unknown origin in which seemingly normal people begin to spontaneously commit suicide by any means at their disposal. Some run into traffic and others smash their heads into glass windows. Malorie (Bullock) is pregnant and after a visit to the doctor with her sister, Jessica (Sarah Paulson), the madness hits her town and she must try to stay alive before this unseen force makes her go mad. After losing her sister she makes it to cover with other strangers into a house filled with other folks from various walks of life. Bird Box is structured in flashbacks and in the present tense. In the present Malorie has her two children that she is trying to keep alive and trying to get to a shelter. The flashbacks show what happened in the early stages of world falling to madness. What it never showed was what actually caused it. Folks are probably going to compare Bird Box to A Quiet Place. That film actually showed you what was out there. Bird Box shows you NOTHING except the after effects. I’m all for using your imagination but this film should have shown you what was out there. A Quiet Place at least had some cool creatures out there. Bird Box had nothing. Bird Box is a fine film on a technical level and in terms. The script and plotting are what I had more of a problem with. It was a random film in terms of what was happening. There’s no allusion of what was happening in that world. Who, what, when, where, etc., nothing. I think early in the film it’s mentioned that people started killing themselves in Russia. Okay, well, what caused it and was is the unseen force making folks kill themselves? Is it a monster or alien? Is it man-made? There too much of that left up in there that frustrated me. As far as what I did like – the acting by all involved was top-notch. Bullock was great and so was John Malkovich. I’m not sure if Bird Box ever had a life outside of Netflix – I don’t know if it was initially conceived as a theatrical release or if it was always slated for Netflix. I do think it would have bombed if it had been released theatrically but now that it’s on Netflix and folks can watch it at their leisure they will come to their conclusions. I’d say it’s almost worth a watch. Half-a-decade after a malevolent presence spread across the world causing unexplained mass suicides, one woman (Sandra Bullock) and her two young children is left on her own to find her way to the hope of safety blindfolded, the only way to protect oneself it seems from infection by the odd presence. Bird Box has some fine acting and character moments but fails to deliver a concrete supernatural thriller due to a lack of exposition. A Quiet Place did it much better.